The game's afoot for Activision Blizzard (ATVI). The company behind the "Call of Duty," "Skylanders," and "World of Warcraft" video game franchises posted better than expected results after Wednesday's market close. Adjusted earnings more than doubled to $0.15 a share as revenue rose nearly 20% to $751 million. 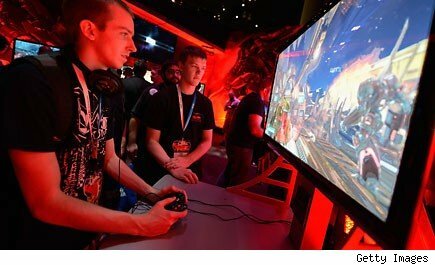 The showing was considerably better than Activision Blizzard's own guidance issued three months earlier, which called for an adjusted profit of $0.07 a share on adjusted revenue of $690 million. Activision Blizzard was already having a strong year as "Skylanders Spyro's Adventure," "Diablo III," and "Call of Duty: Modern Warfare 3" happened to be the three best selling games of the year at the retail level through the first half of 2012. All three continued to sell well into the third quarter, and a new expansion pack -- "World of Warcraft: Mists of Pandaria" -- helped sustain the franchise's popularity. Activision Blizzard is raising its guidance for all of 2012 as a result of the strong showing. Who says video games are dead? • The country didn't vote red on Tuesday night, but the market saw plenty of it on Wednesday. The nearly 313-point plunge in the Dow on Wednesday was the market's sharpest drop of 2012. Some might suggest that the market wasn't pleased with the way that the presidential election played out, but it was actually negative news out of Europe earlier in the day that set the bearish tone. Investors will be anxious to see if the market can bounce back on Thursday. • Whole Foods Market (WFM) is still making natural groceries pay off. The chain of organic supermarkets is boosting its quarterly dividend rate by 43% after another quarter of strong growth. Fueled by a robust 8.5% spike in same-store sales, Whole Foods saw its sales rise 24% to $2.9 billion. A cautious outlook for the balance of fiscal 2013 held the shares back in afterhours trading on Wednesday night. • Monster Beverage (MNST) continues to be a beast of an investment -- and that's not a compliment. Shares of the energy drink maker also moved lower on Wednesday night. Monster's sales of $542 million in its latest quarter were woefully short of the $578 million that analysts were forecasting. Are consumers starting to scale back on health concerns of these adrenaline-fueling beverages? The stock was hammered over the summer as some politicians were calling for more regulation and label warnings for energy drinks in general. Motley Fool contributor Rick Munarriz does not own shares in any of the stocks in this article. The Motley Fool owns shares of Whole Foods. The Motley Fool owns shares of and has written calls on Activision Blizzard. Motley Fool newsletter services have recommended buying shares of Monster Beverage, Activision Blizzard, and Whole Foods and creating a synthetic long position in Activision Blizzard.